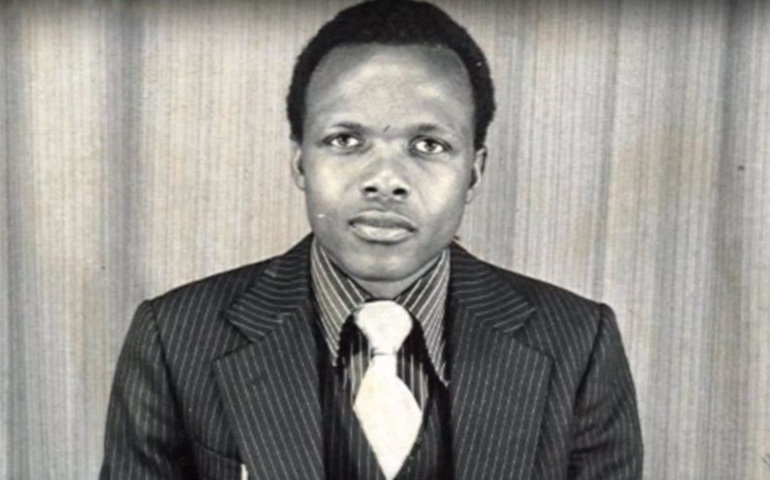 Blessed Benedict Daswa was a husband and father, a school teacher and principal, and a modern-day martyr for his Catholic beliefs. Tshimangadzo Daswa Bakali was born in 1946 at the village of Mbahe in the Province of Limpopo, in South Africa. His given name was Tshimangadzo; his family name Daswa; and his clan name Bakali. He was the oldest of four children. His family were members of the Lemba tribe, who were known as “Black Jews”, and who held to Jewish practices and traced their lineage to Jewish traders more than a millennium ago. Tshimangadzo’s father operated a small farm and worked as a carpenter; his mother assisted with the farm work and worked as a seamstress. The family was hard-working, loving, and hospitable. As a child, Tshimangadzo worked with the livestock and tended his own small garden, and when he began attending school, his parents added “Samuel” to his name. He was a good student, and advanced into secondary school. When he was a teen, his father died in an accident, and he accepted responsibility to make sure his younger siblings were properly educated. In 1963, aged seventeen, he converted to the Catholic Faith after being introduced to it while visiting Johannesburg and being catechized for two years. At his Baptism and Confirmation, he took the name Benedict. He chose that name after two people: St. Benedict of Nursia, whose maxim was pray and work; and Benedict Risimati, who was his catechist. In 1968, Benedict attended a teacher’s college, graduated in 1970, and began teaching primary grade children at Tshilivo, less than twenty kilometers away from home. While teaching, he achieved accreditation as a school administrator. He also worked as a catechist, and he took special interest in helping poor children and teens. In 1974, Benedict married Shadi Eveline Monyai, and the couple went on to have eight children. 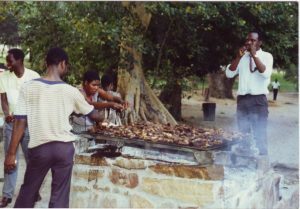 In 1977, Benedict accepted the job of principal at Nweli Primary School. As a principal, he was strict but fair. Out of concern for the poorest students, he would offer them work in his large fruit and vegetable garden in order to earn the money for school books and uniforms. His devotion to the school and its students was impressive, as he built new classrooms, introduced school gardens, and fostered student involvement in athletics and music. He was very devoted to the well-being of his students, and was known to visit families who were experiencing troubles. As a husband and father, Benedict was strikingly devoted to his family. He built the family brick home and spent a great deal of time helping his wife with domestic chores. It was not unusual to see him washing and drying his children’s “nappies”, a task unheard of for a father in that culture. He worked hard in his 2 acre garden, developed an efficient watering system, and sold the produce to local markets to support his family. 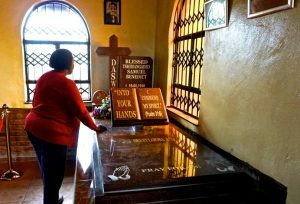 Before going to bed, his family would gather to read a Scripture verse, pray and sing, and recite the Act of Contrition. He was chosen to be chairman of his parish’s first pastoral council. He taught the Catechism to both adults and children, visited the shut-ins, and sought out those who had wandered away from their Catholic faith. He was especially devoted to the youth, helping them with retreats, sports outings, and vocation seminars. Practices of witchcraft were still common in Benedict’s area. Rumors spread about Benedict’s gardening success being a product of the work of “zombies.” Beginning in November 1989, heavy rains came, along with lightning and heavy winds, causing damage. The village elders attributed this to witchcraft, and they required a fee from the villagers in an effort to bring a sangoma to drive away the evil spirits. Benedict refused to participate, knowing that the weather problems were due to natural phenomena, and that contributing to occult practices would be idolatrous. This was regarded by some as a rejection of tribal customs. On February 2, 1990, after taking passengers to a doctor visit, he encountered fallen trees blocking a rural road. When he got out to clear the road, he was assaulted by a group of young men. They stoned, beat, and clubbed him to death. His last words echoed those of Our Lord, “God, into Your hands, receive my spirit.” He was forty-three years old. His funeral eight days later was attended by over thirty thousand people. He was buried at his village of Mbahe, and when Eveline died, her remains were placed next to her husband. Blessed Benedict Daswa was beloved not only to his family, but to the many children he mentored at school and at his parish. He is especially remembered for his wonderful garden, out of which he gave generously to those in need. His love for God and fidelity to his faith was evident to those who knew him. He lived an exemplary life as a layman. In January of 2015, Pope Francis approved recognition of Benedict as a martyr. In September of that same year, he was beatified at Limpopo, a Mass that was attended by his elderly mother and his eight children, and tens of thousands of other faithful. Benedict’s feast day is February 1, and he is a patron for teachers and principals, and against witchcraft and occult practices. He is the first person from South Africa to be declared a martyr for the Church.